You’ve heard it over and over again- backup, backup, backup! The importance of backing up your site goes unseen until a problem arises. Instead of barking the need to backup your site to you (because you already know that, right?) I’m going to show you how to backup your SQL database. 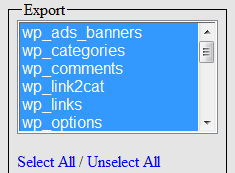 For the purposes of this tutorial, I’m going to backup my WordPress database. 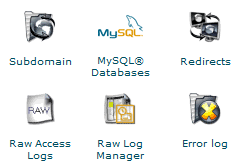 First, login to your site’s cPanel and click on the “MySQL Databases” icon. Scroll to the bottom of that page and click on the “phpMyAdmin” link. Once you select your database, you will notice some tabs towards the top of the screen. Click on “Export”. Next, on the left side of the screen you can select which tables to export. Click the “Select All” link. Be sure all the tables are selected. Towards the bottom of that screen, click the “Save as file” box, and name the file something you can easily remember. Click the “Save” button to save the file to your computer. Congratulations! You have just saved a copy of your database. Keep it in a safe location. If you ever need to restore a backup at a later date, click on the “Import” tab on the same screen you just clicked “Export” and select the database backup file you wish to restore to. This should be a part of your regular routine. How frequently you decide to backup your database depends on you. The busier your blog is, the more frequent you should backup your database. Don’t wait until it’s too late to set 5 minutes aside for regular website backups! I know this short tutorial may seem elementary for many of you, but now if you’re blog crashes I can say “I told you so”! It’s even easier to automate this with a cron job. I blogged about it in the past and because I am nice enough to blog under a Creative Commons License you can feel free to search my blog for that cron job script and post it here! BTW: When you have your own server you will find yourself running cron jobs all the time and doing a lot of backing up. Sometimes your web host will offer to restore from their nightly backups (for a price) but when you host yourself you have no one to cry to! Here it is: Cron Backup. I used that one a lot in the past for clients. I went to your site looking for it but didn’t find it. Thanks for the link. Cron jobs sure make the process easier. In WordPress, simply go to Manage.. Export! I do this after every post, even though my ISP does “nightly” backups. It will create a backup every hour, day or week and you can have it sent to a specified email. That way I never have to think about it.